Born in Berkeley, California, he accepted Islam in 1977 while serving in the United States Air Force. He obtained a BA with honors in International Relations at American University in Washington D.C. and later earned his MA in Political Science at Rutgers University. While at Rutgers, he led a successful campaign for divestment from South Africa, and co-founded New Brunswick Islamic Center formerly Masjid al-Huda. After a year of studying Arabic in Cairo, Egypt, he settled in New Haven, Connecticut and continued his community activism, co-founding Masjid Al-Islam, the Tri-State Muslim Education Initiative, and the Connecticut Muslim Coordinating Committee. 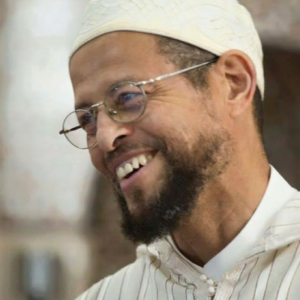 As Imam of Masjid Al-Islam from 1988 to 1994 he spear-headed a community renewal and grassroots anti-drug effort, and also taught political science and Arabic at Southern Connecticut State University. He served as an interfaith council Chaplain at Yale University and developed the Chaplaincy Sensitivity Training for physicians at Yale New Haven Hospital. He then left for Syria to pursue his studies in the traditional Islamic sciences. In 2003, he moved to Hayward, California to serve as a scholar-in-residence and lecturer at Zaytuna Institute, where he taught courses on Arabic, Islamic law, history, and Islamic spirituality. In 2004, he initiated a pilot seminary program at Zaytuna Institute, which was useful in Zaytuna College’s refinement of its Islamic Studies curriculum and its educational philosophy. For four years, students in the pilot program were engaged in the study of contemporary and classical texts. In 2005, Zaytuna Institute published, Scattered Pictures: Reflections of An American Muslim„ an anthology of diverse essays penned by Zaid Shakir. He co-founded the Lighthouse Mosque, Oakland, CA. in 2007. He authored an award-winning text, Treatise for the Seekers of Guidance, a translation and commentary on Imam Harith al-Muhasibi’s work, Risala al-Mustarshideen in 2008. He is co-founder and chairman of United For Change since 2009. The mission of United For Change is, through modern discourse, to create awareness of the broadest and most consuming topics within the Muslim community. The aim is to leverage the diversity through cooperation and goodwill and address the obstacles that have proven to be divisive. His most recent work is Where I’m Coming From: The Year In Review, a new collection of his essays from 2010. Imam Zaid has also authored numerous articles and research papers on a wide range of topics.